It has been my idea that writing on everything Kauai Hawaii would offer our readers a guide, albeit from my perspective, about our island, and hopefully assist them in making intelligent choices to find the best things to do in Kauai. One of the highlights of this ‘task’ is to review Papalani Gelato in the Poipu Shopping Village close to our Kauai vacation rental. I tend to seek out places that are family businesses, I see the owners laying it on the front line everyday. Starting with an idea, nurturing it as it germinates, and experimenting until it flourishes. In the process creating a tidal wave of work for themselves, with a liberal sprinkling of sleepless nights, with only a dream spurring them on. That is the free wheeling spirit that is so easily recognized with American individualism and optimism. One of these family businesses is Tortilla Republic Mexican Grill and Margarita Bar in the Kukuiula Village. It’s one of the Kauai restaurants that should be on your list. A recent addition to their menu has been the hand crafted gelatos created by Papalani Gelato. Marck and Lauren Shipley have been producing great gelatos, sorbettos, and chocolate confections for the past three years on Kauai. 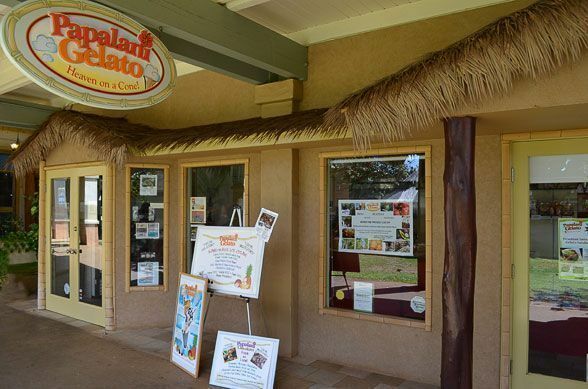 Their gelateria is located in the Poipu Shopping Village where their friendly staff will delight and entertain as they allow you to sample all the great flavors. Their use of all local ingredients is a testament to their beliefs in supporting local fruit growers, sustainable Kauai, and giving back to the community. Our reward is experiencing great tasting fruit gelatos and sorbettos at the highest levels of taste and freshness. A recent creation by geletaio Marck, it is the signature gelato at Tortilla Republic combining everything you like about chocolate with the warming characteristic of chili that sits gently at the back of your mouth. Not overwhelming but assisting in the enjoyment of the final chocolate tones. Their gelatos have taking Kauai by storm and while a surprising number of people are not familiar with this delightful creation that hails from Italy, they are sure of one thing that the taste is incredible and an exciting alternative to ice cream. The milk to cream ratio is different between the two, ice cream has a fat content from 10% to 20% while Gelato has a fat content of 3%-8%. This is significant when it comes to taste. High fat content in a confection overwhelms and dulls the approximately 9000 taste receptors that are responsible for sending messages to the brain. With a lower fat content the receptors are able to pick up and distinguish flavors more acutely thus sending clearer messages to the brain enabling you to identify the subtle notes that gelato leaves on the palate. This is particularly important with food pairings. We found that Papalani’s Salt Pond Gelato paired very nicely with the deep richness of chocolate. Complementing it on so many levels, from the sugary baritones of the rich chocolate to the lilting salty hint of the gelato. Like a friend who coaxes and brings out your best, the gelato enables one to appreciate chocolate on the next level. But then, the gelato exerts its own personality with the salty hints giving way to a sweet light butter scotch after taste that cleanses the palate. Making you forget the chocolate for perhaps 1 or 2 minutes of conversation before grabbing your spoon and jumping back into this delightful dessert combination. Gelato requires higher serving temperatures than ice cream. The gelataio, or craftsman must find the proper temperature range that results in an easy scoop and a perfect amount of time to consume the treat before it melts. We know that gelatos have a lower fat content, but the lower air content makes for a rich, creamy treat that offers more taste with significantly less fat content. Gelato is churned at much slower speeds resulting in a natural air content of 25-35%. Ice cream has air added during the churning process resulting in an air content of 50% or more for ice cream. Lee Morey is the Principal Broker of Coldwell Banker Turtle Cove Realty in Kalaheo, Kauai. She writes frequently about real estate Kauai and great things to do when your visiting the island.